Heroic Fantasy Writers: 27 Likes For My Abandoned Towers Story--Keep 'em Coming! 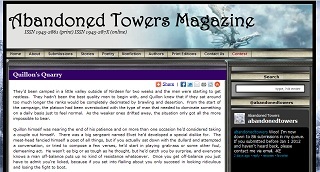 27 Likes For My Abandoned Towers Story--Keep 'em Coming! Recently I decided to go back to my roots and find some markets on Ralan that wanted some short stories. I still think it's a good idea to get your work out there in as many venues as possible, so on the days you don't have energy to work on a whole novel, rattling off a short story can be fun. Hey, who knows? Sometimes I find that you start going on what seems like a throw-away story and find yourself not stopping until you've ripped off 50,000 words. Anyway, I shipped off a fun little fantasy story titled "Quillon's Quarry" to Abandoned Towers, and they've just thrown it up on their blog. Please do me the favor of giving it a read and hitting "Like" or "Retweet" or giving it a shout-out on whatever social network you prefer. I'm already sitting at 27 likes, and the more I get, the more likely Abandoned Towers is to pick up stories of mine in the future. I've got a special affection for them because they were the first ezine to interview me when "The Bone Sword" came out. Incidentally, the kindle version of "The Bone Sword" is still sitting at ninety-nine cents, so give it a look if you enjoy "Quillon's Quarry." The story is free to read, I hope you like it!